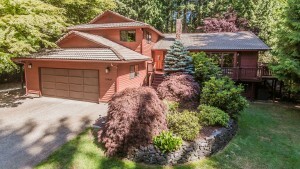 Beautiful 5 bed 2.5 bath custom home in Lake Tapps. Int features include a Spacious Kitchen w/eat-in area & Island, Formal Dining, Living rm w/ Fireplace, Fam Rm w/wood stove, Vaulted Ceilings, Extra Lrg Master w/bath, lots of windows for natural light, Mud Rm, Rec Rm, & tons of storage. Ext features include Huge wrap around mahogany deck, sports court, Att & Det 2 car garages. Home has access to 3 private parks, private beach, tennis courts, boat launch, and picnic areas. Must see property!